According to the Article 133 of Constitution of Ukraine, "the system of the administrative and territorial structure of Ukraine is composed of the Autonomous Republic of Crimea, oblasts, districts, cities, districts in city, settlements, and villages." Note, that although certain types of subdivision are not mentioned in Constitution of Ukraine (i.e. rural settlements), they are mentioned for regional composition. Also, for disambiguation regular raions (districts) are sometimes denoted as rural to distinguish them from raions in city. By geographical characteristics the units are divided on regions (such as autonomous republic, oblasts, districts, cities with special status) and places of settlement (cities, towns, villages). By their status they can be administrative-territorial units (oblasts and districts), self-governed territorial units (cities, towns, villages). Also the autonomous republic has a unique status of territorial autonomy, while districts in cities combine both characteristics of administrative territorial as well as self-governed territorial units. By position in the system of administrative division of Ukraine, the units divided into territorial units of prime level (cities w/o district division, districts in cities, towns, villages), of middle level (districts, cities with district division), and of higher level (autonomous republic, oblasts, cities with special status). Administrative division has changed because some territories are not under the control of the government. For example, Sievierodonetsk has become the new central regional center. Regions, cities, districts are governed by a state administration, a chief of which is appointed by the president after a nomination by the cabinet of ministers. Crimea has its own cabinet of ministers, however the state administration is represented by the office of the Presidential Representative of Ukraine. A basic and the lowest level of administrative division is a settlement that is governed by a local council (rada). Cities as a settlement always carry a special status within a region and have their own form of self-administration (municipality – vykonkom) and some may consist of their own city's districts (raions). City municipalities are governed by a mayor and a city council (miskrada). Some smaller cities, towns, and rural localities may be under control of city municipalities based on larger cities. Towns as well as villages are not controlled by state administration and are self-governed by either a town council (selyshchna rada) or a village council (silrada) within the limits of the Constitution and the laws of Ukraine (article 140 of the Constitution of Ukraine). Village councils may carry a combined jurisdiction which may include several villages and hamlets (selyshche). Unlike villages, each town council always has a separate jurisdiction which may be part of bigger city's council. Hamlet (selyshche) is a non-governed rural locality and is governed by a village council of nearby village. Ukraine is divided into 3 main administrative divisions: oblast (region), raion (district), and council (city, settlement, and village). 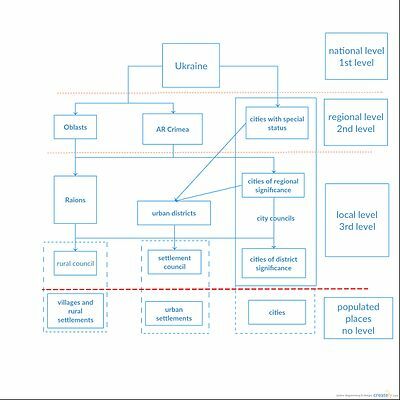 Note, settlements such as cities do not necessary constitute the basic level of the Ukrainian administrative territorial system. For that purpose cities are categorized into own three categories that correspond to each level of subdivisions. Cities with special status and regional significance beside being divided into special districts in city may also include smaller cities (district significance), settlements, and/or villages. Please, note that the settlement's population size is not the only factor for its status. The final decision on status change is carried out by the Ukrainian parliament. The following table is based on the 2001 Ukrainian Census. The following numbers are based on the 2001 Ukrainian Census. Total cities: 454, an increase of 20 compared with the 1989 census. Before the introduction of oblasts in 1932, Ukraine comprised 40 okruhas, which had replaced the former Russian Imperial guberniya (governorate) subdivisions. In 1932 the territory of the Ukrainian SSR was re-established based on oblasts. Excluded in the administrative changes was Western Ukraine, which at that time formed part of the Second Polish Republic and shared in the Polish form of administrative division based on voivodeships. In the post-World War II period, the Ukrainian Soviet Socialist Republic consisted of 25 oblasts and two cities with special status. After the fall of the Soviet Union in 1991, Crimea obtained the status of an autonomous republic with its own government instead of a regional state administration. The Autonomous Republic of Crimea, formerly the Crimean Oblast of the Ukrainian SSR, geographically encompasses the major portion of the Crimean peninsula in southern Ukraine. Its capital is Simferopol. The Autonomous Republic of Crimea is the only region within Ukraine that possesses its own constitution. On March 16, 2014, after the occupation of Crimea by the Russian military, a referendum on joining the Russian Federation was conducted. A majority of votes supported the measure. On March 21, 2014, the Russian Duma voted to annex Crimea as a subject into the Russian Federation. The Ukrainian government does not recognize the referendum or annexation of Crimea as legitimate. On March 27, the UN General Assembly passed Resolution 68/262 by 100 to 11 votes, recognizing the referendum as invalid and denying any legal change in the status of Crimea and Sevastopol. Oblasts are on the first (top) level of the administrative division of Ukraine. Almost every oblast is named after its administrative center, except for four oblasts. Volyn' and Zakarpattia, whose respective capitals are Lutsk and Uzhhorod, are named after historic regions Volhynia and Transcarpathia. The administrative centers of the Dnipropetrovsk Oblast and the Kirovohrad Oblast were renamed to Dnipro and Kropyvnytskyi in 2016, however as of 2017 the oblasts still officially bear the old soviet names as their change must be reflected in an amendment to the Ukrainian Constitution. Two cities carry special status: the city of Kiev which is the capital of Ukraine and the city of Sevastopol. Following the 2014 Crimean crisis, Sevastopol is controlled by Russia and is incorporated as a federal subject of Russia. It is recognized as a part of Ukraine by most of the international community. Raions are smaller territorial units of subdivision in Ukraine. There are 490 raions. The Dnieper River plays an important part in Ukrainian territorial division, with many large cities settled on its banks. Here, the capital city of Kiev which was founded on the Dnieper's right bank but for now expanded over the river significantly. Ukraine has two types of settlements: rural and urban. Rural populated areas (сільський населений пункт) can be either a village (село, selo) or a rural settlement (селище). Urban populated areas (міський населений пункт) can be either a city (містo) or an urban-type settlement (селище міського типу). For the sake of brevity, urbanized settlements are sometimes classified as towns in the English language. Changes to a settlement's status can be made only by the Verkhovna Rada. Please note that the size of a settlement does not ultimately define its status, although is a major factor. For example, the city of Prypiat still retains its status, while having a population of zero, due to its infrastructure, including buildings, roads, and utility networks. The typical Ukrainian misto ought to be considered a city, not a town (compare to City status in the United Kingdom). However, the city's subordination to either an oblast or raion also should be taken into account, especially in the political sense. Some of urbanized settlements may be cities of raion subordination, although it could seem confusing, a type of settlement should be considered first as its status is given for administrative purposes. Kiev Oblast for instance, has several regional city municipalities such as Pereiaslav-Khmelnytskyi, for example, that are under direct subordination to the regional authorities. They are officially known as cities of regional significance. Drohobych, is a city of oblast subordinance, subordinate to the Lviv Oblast authorities rather than to the local Drohobych Raion administration. According to Ukrainian law a city (місто) in Ukraine is a locality of at least 10,000 people. Cities may carry various status. Some may be of national importance, others of regional (oblast) importance, and the rest of district (raion) importance. For example, the cities of Kiev and of Sevastopol have special status of national significance and each is officially classified as a city with a special status, which administratively is equivalent to an oblast. Mayors of those cities, in general, as are governors of oblasts, are appointed by the President of Ukraine. However, the status of the mayor of Kiev is somewhat more complex, and for further information see Legal status and local government of Kiev. The status of Sevastopol is also unique. Almost every oblast has at least one city of regional subordination (importance), which is the administrative center (capital) of that oblast. However, some other big cities within the oblast may have such status as well. The cities of oblast subordination have the same importance of a raion, and often are the administrative centers of such. In addition to regular raions, several Ukrainian cities with national or oblast status are further divided into city raions which may include other cities, towns, and/or villages. In 2010, Ukraine had 23 such cities with their own city raions. Many raions also have city municipalities of its level of subordination (importance). Those are usually the administrative centers (capitals). Notice that not all raions have a city as their administrative center; however all the raion centers are at least urban-like (urbanized). All administrative centers have their own form of self-administration. The municipalities of a raion subordination may administer several adjacent local councils (municipalities), usually rural. If a raion has several cities of raion (district) level, they may share administrative power for the raion. In addition to city municipalities, Ukraine has urban-like municipalities. The lowest form of self-administration are the rural municipalities and villages. A rural municipality may consist of a single village, usually big, or a combination of other rural villages or localities. Note that some villages also have some additional, very small settlements. Those settlements, together with the home village, combine a local (rural) municipality (silrada). For simplicity's sake, a silrada (rural municipality) is usually referred to as a village and is the lowest level of administrative division. The status of any settlement is granted by the Verkhovna Rada. In his draft constitutional amendments of June 2014 Ukrainian President Petro Poroshenko proposed changing the administrative divisions of Ukraine, which should include regions, districts and "hromadas". On February 5, 2015, the law "On voluntary association of territorial communities" was adopted creating Amalgamated territorial communities meaning settlement councils, rural councils and a city of district significance can create a new administrative unit. New local elections in these united territorial communities were then held. 226 will be holding elections in 2018 and 2019. The first 252 were held in 2017. The Law "On Local Self-Government in Ukraine" stipulates that local budgets should have enough money to be administered by local self-government bodies. Because many of the small rural councils and cities of district significance could never hope to do this the new administrative unit Amalgamated territorial community (Ukrainian: Об'єднана територіальна громада, Obyednana terytorialʹna hromada) was created. Ukraine also has several settlements known as viiskove mistechko which were former military installations. Since the fall of the Soviet Union, the secrecy of such settlements has been unveiled, however, the towns are subordinated directly to the Ministry of Defense and do not have their own civil administrations. Such military installations are like ghost towns that are not even identified on a map. One of them, on the border of the Kiev and Zhytomyr Oblasts is Makarov-1. A special territory known as the zone of alienation falls under the jurisdiction of the Ministry of Emergencies and was the most severely affected territory by the Chernobyl disaster. Additionally, various restricted nature preserves known as Zapovednik fall under the jurisdiction of the Ministry of Ecology. Due to the War in Donbass, the status of civil–military administrations was created in territories of Donetsk and Luhansk oblasts where the respective local government units cannot exercise their constitutionally guaranteed powers. A mix of modern and old buildings in Dnipro, located in Dnipropetrovsk Oblast. Dnipro's metropolitan area includes cities such as Kamianske and Novomoskovsk. The city of Slavutych which is administratively subordinated directly to Kiev Oblast while being completely surrounded by neighboring Chernihiv Oblast. The settlement of Bile which is located on Snake Island and is fully surrounded by the Black Sea was established in 2007 and is part of Vylkove, Odessa Oblast. The town of Kotsiubynske which is part of the Kiev Oblast and is completely surrounded by the city of Kiev. Ukraine has five major agglomerated metropolitan areas (conurbations). These conurbation areas are not officially recognized and remain to be administered according to official oblast-raion system of subdivision. Beside the administrative divisions, geographical divisions are at times used for reference or statistical purposes. The division splits Ukraine into 4 to 6 geographic areas: Western Ukraine, Eastern Ukraine, Southern Ukraine, Central Ukraine, Northern Ukraine (occasionally used). The neighboring countries such as Russia, Poland, Hungary and Romania sometimes identify certain parts of Ukraine. For example, Russia has territorial claims to Ukraine stating that the Southeastern Ukraine is part of Russia, certain political or public figures in Poland lay territorial claims to western Ukraine identifying them as Borderlands or Kreis (Kresy), the same goes for Hungary that calls Zakarpattia Oblast as Kárpátalja. The region of South-Eastern Ukraine appeared following the Orange Revolution as a political project of the Party of Regions to create a Russian autonomous territory known as the Southeastern Ukrainian Autonomous Republic. ^ City municipalities that are administrated as a separate region. ^ Normally identification of rural is not used with raions, while for disambiguation districts in cities are identified with those cities. ^ Regional municipalities may include cities of oblast or republican (in case of Crimea) significance. ^ Often times, the identification of "urban" with "settlement" is not used and raises some ambiguity with smaller rural settlements. ^ Also referred to as towns. ^ Normally identification of rural is not used. ^ Regions of Ukraine and their composition Archived 2011-12-26 at the Wayback Machine. Verkhovna Rada website. ^ a b c Regions of Ukraine and their composition Archived 2011-12-26 at the Wayback Machine. Ukrainian parliament website. ^ "Regions of Ukraine and their composition". Verkhovna Rada of Ukraine (in Ukrainian). Archived from the original on 26 December 2011. Retrieved 25 December 2011. ^ "Decentralization". The Reforms Guide. 2017-02-10. Retrieved 2018-12-28. ^ "In Kiev region a military installation cannot vote". Podrobnosti.ua (in Russian). 31 October 2012. Archived from the original (Video) on 2012-04-04. Retrieved 8 February 2012. ^ "Poroshenko gave the green light to create civil-military administrations". Ukrayinska Pravda. Ukrainian. 26 February 2015. Retrieved 26 February 2015. ^ "Selysche Bile, Odessa Oblast, Kiliya Raion, city Vylkove". Regions of Ukraine and their Structure (in Ukrainian). Verkhovna Rada of Ukraine. Archived from the original on 2014-03-03. Retrieved 8 February 2012. ^ "cities of regional significance" is a translation of Ukrainian: Міста обласного значення. ^ Chairman of the Regional (or City) State Administration. ^ Vitaliy Klychko serves both as a mayor and a governor for the city of Kiev since 25 June 2014 (see Mayor of Kiev). Wikimedia Commons has media related to Atlas of Ukraine. "Ukraine Raions". Statoids. Retrieved 8 February 2012. "Ukrainian cities and regions in alphabetical order". UkraineTrek. Retrieved 10 February 2012. This page was last edited on 17 January 2019, at 12:08 (UTC).